We gather to hear presentations and have conversations in small groups about various topics and faith traditions. February - The Steering Committee had a lunch together at McKendree University sharing thoughts and ideas for development and friendship. Dr. Kibria provided entertainment with a performance on his harmonica. June 30 - Religious Freedom Conference on the 1st Amendment - three speakers 2 Judges and 1 faith leader discussed religious freedom implications and current events. Hosted by The Church of Jesus Christ of Latter-Day Saints - O'Fallon Illinois Stake. August - Interfaith Worship Service Visit - we encourage you to visit with a friend to another faith's worship service and report back on the visit on our website or Facebook page. Let us know what your experience was, what you learned and how you grew. October 21 - Religious Freedom Conference on "Transforming American Democracy and the 14th Amendment" - We hosted Dr. Mahrukh Khan, Judge Daniel Emge, Judge John O'Gara and Judge Rudolph Heinz. Hosted at the Belleville Masjid and Islamic Education Center; 3-4:30 p.m. The Steering Committee had a lunch together at McKendree University sharing thoughts and ideas for development and friendship. Sunday Nov. 5th - Rev. Dr. Douglas Cripe will be hosted by the Masjid Islamic Center from 3-5 p.m. 4525 Old Collinsville Rd., Belleville, Illinois for another installment of our "Community Conversations." What is everyday living like in your culture? What is the role of women in your culture? Does every Jewish person follow the same guidelines? Do Hindus worship multiple gods? Are Mormons followers of Christ? This event was co-sponsored by Our Lady of the Snows Shrine and the Metro-East Interfaith Partnership. During 2009 we heard from the Bahá'í and Community of Christ traditions. During the beginning of 2008 we invited the following faith traditions to help us learn more about their faith. How does your faith tradition engage in prayer? Getting to Know Your Muslim Neighbors. How does your faith tradition celebrate important life events for teens? 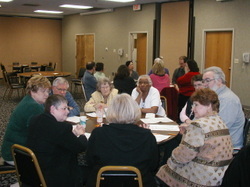 On February 27, 2006, participates engaged in informal dialogue on the topic: "What our faith traditions say about forgiveness, repentance, and reconciliation." Presentations began with reflections from the Jewish, Christian, and Bahá'í faiths, with time for conversation in small groups. On March 27, 2006, another evening of Interfaith Conversations focused on "What our faith traditions say about healing and wholeness" with presentations by Christian, Muslim, and Bahá'í participants. Prior interfaith topics have included holidays, life events (birth, marriage, wedding, death), and foods.